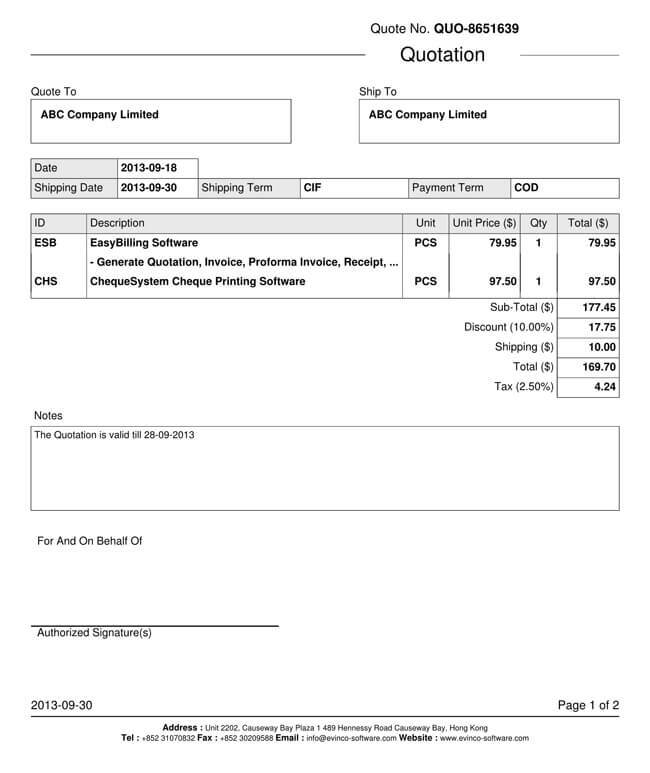 Quotation templates are used when businesses need to communicate to customers how much certain goods and/or services will cost them. 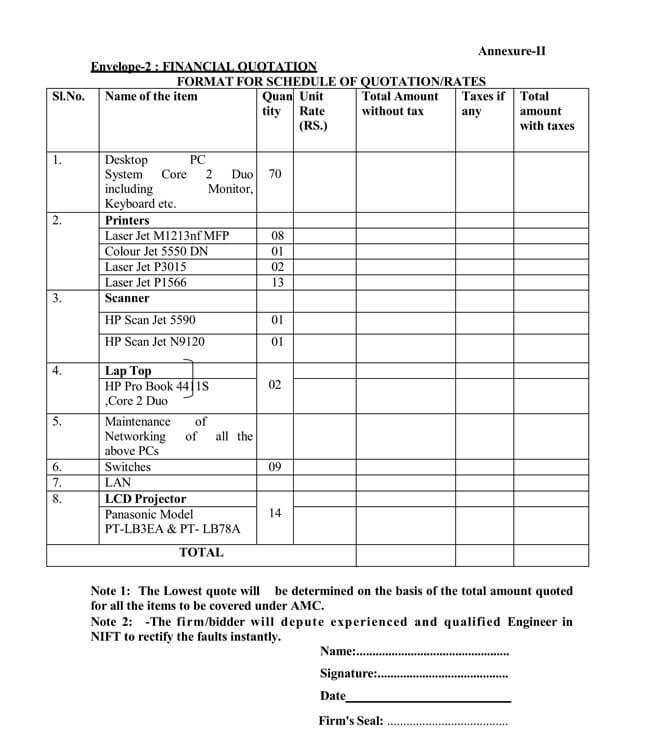 The quotation template will usually include information regarding the goods/services in question, and place this information in a logical and orderly format. 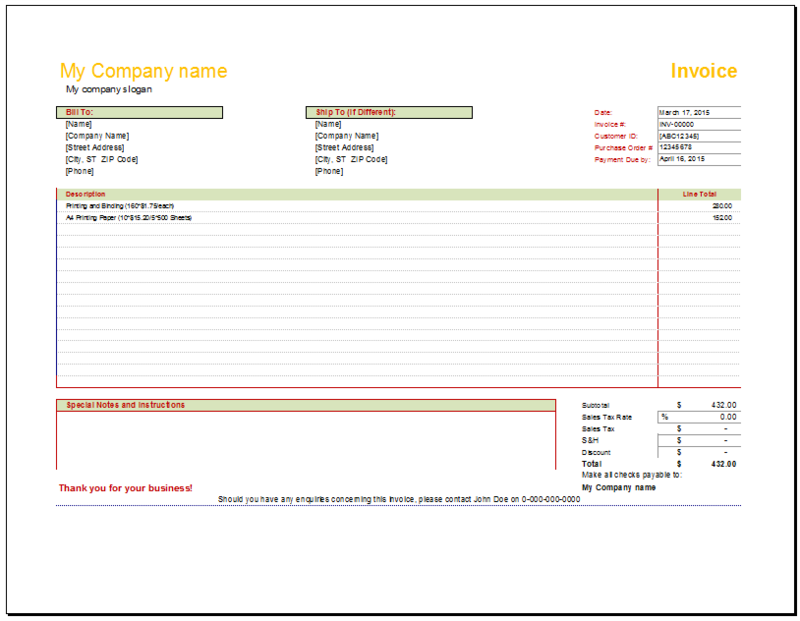 These templates are professionally designed as they are an important tool in many business transactions. They provide a record of what has transpired between client and business owner, regarding prices, terms, goods/services, etc. Quotation templates are professionally designed and reflect the business that they represent. Whether you are the small auto repair shop on the corner, or a merchandiser, a well designed quotation template is an asset to your business. These forms are a way for a business to professionally outline the services and their respective charges to a client, along with any terms of sale, payment terms, or warranties. There are specific advantages to both businesses and clients who utilize quote templates. For instance, a client who must maintain a budget on a particular project will collect quote from a variety of businesses. After sifting through all of the quotes, and their prices, warranty information and payment terms, the client may decide to present a competitors quote to the business of their choice, to see if they can match that quote in order to secure a better deal. 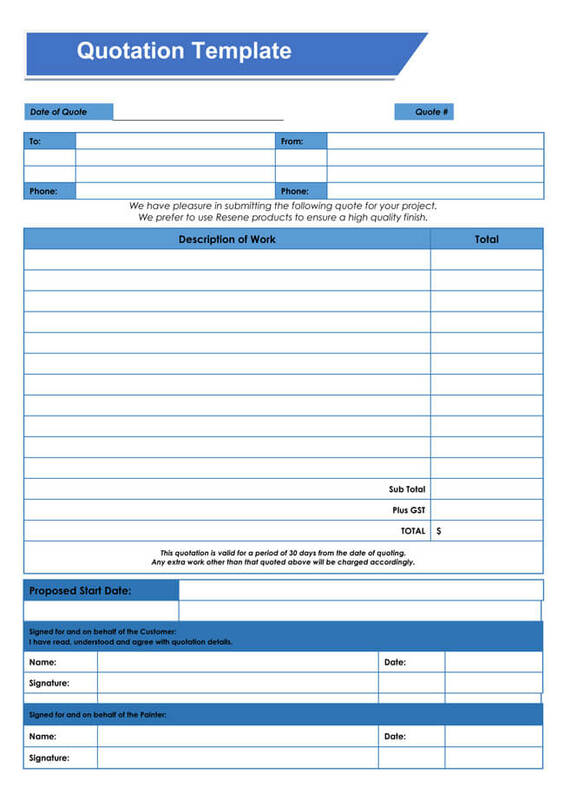 Businesses benefit from quote templates in that these forms are useful in keeping records of business activities, and can also protect the business in case of financial or legal liability. Quote templates assist in collating varied information from a business and present this information to a client in a format that is easy to understand. They not only communicate prices, but also discounts, payment terms, due dates and other pertinent information. All of our quote templates are easy to use, free to download, and are compatible with both Microsoft Word and Microsoft Excel formats. 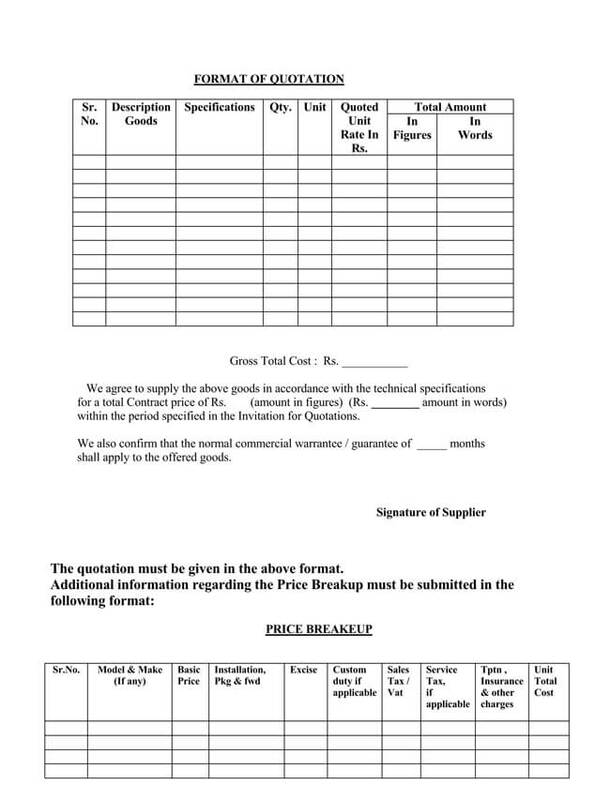 The Product Quotation Template or PQT, is a customizable form which includes the product and the price of that product, along with any explanation deemed suitable by the business and/or client. This is also referred to as the start of a sale, as product quotes are done to initiate a sale, between companies or between a client and company. 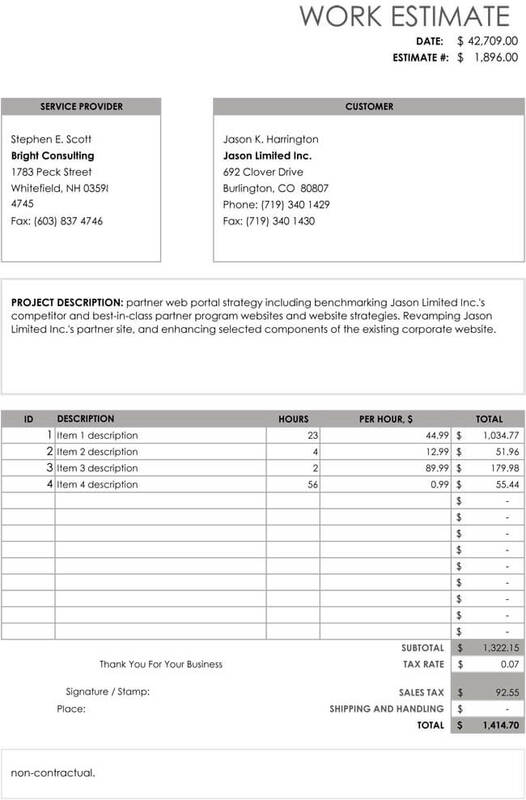 Product Quotation Templates lay out an easy to understand outline of price estimates involved for a project. Our Product Quotation Templates are professionally designed to specifically create a good impression and properly represent your business. All forms are free to download, constructed in a concise and logical manner, easy to read and understand and compatible with Microsoft Word and Microsoft Excel. 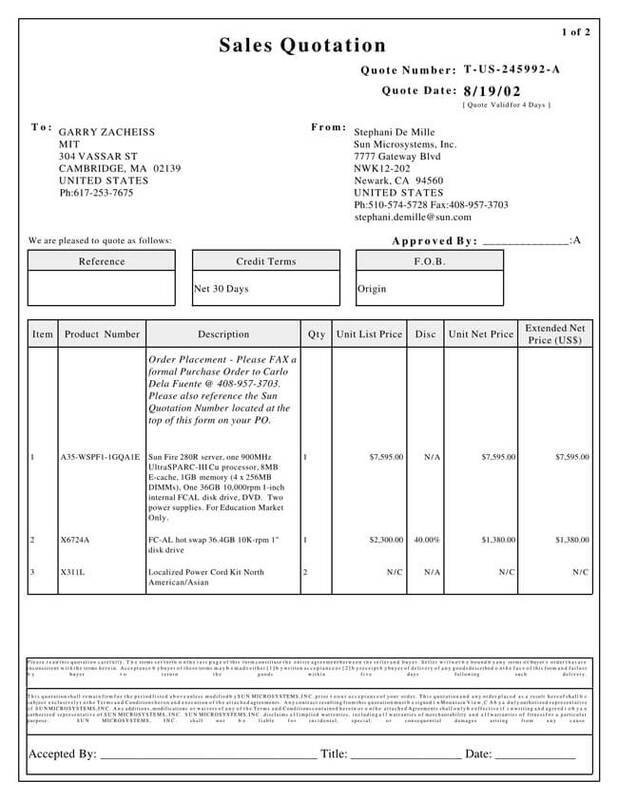 Product Quotation Templates may include information regarding the product, the product number, quantity, space for signatures, reference and credit terms, or name of the salesperson who initiated the business transaction. Also included are areas for Business contact information such as address, phone number, email, website, as well as hours of operation and availability. 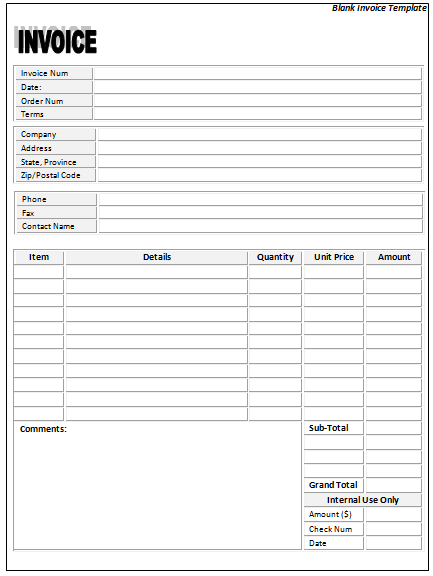 A Sales Quotation Template are used when a business needs a form in any transaction where the cost of goods and/or services can vary. Alterations in price can be due to a number of reasons: materials, seasonal items, labor costs, etc. 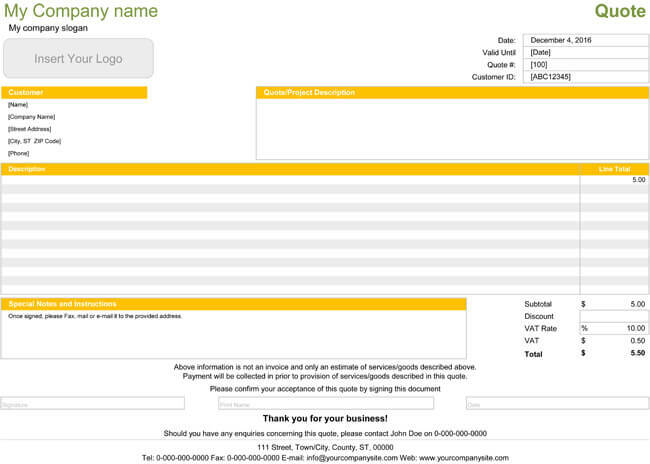 Thus, this form will relate to the customer a rough estimate of how much the good/service will cost them. 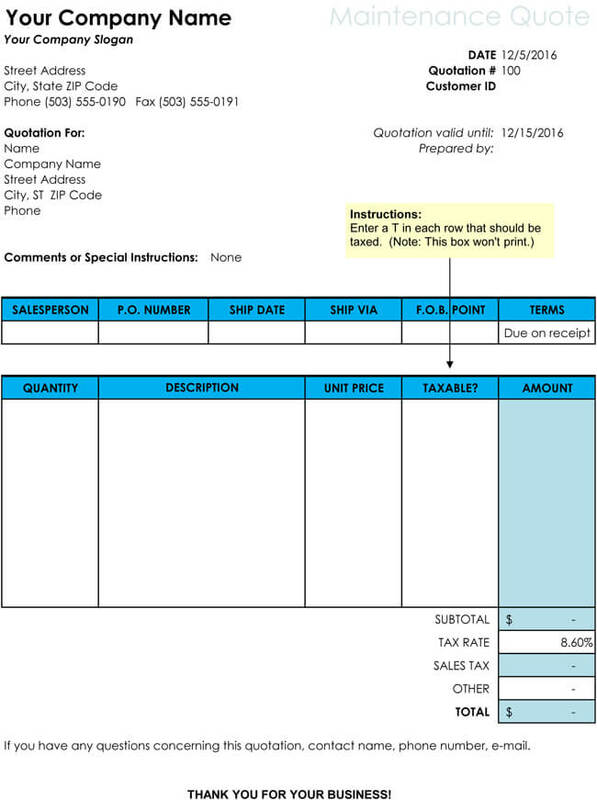 The Sales Quotation Template provides the client with important information such as the name, address and contact information of the business, the name and description of products/services, the quantity to be used, shipping terms, discounts, terms and conditions, possible labor costs, as well as stipulating what factors could cause a price change. 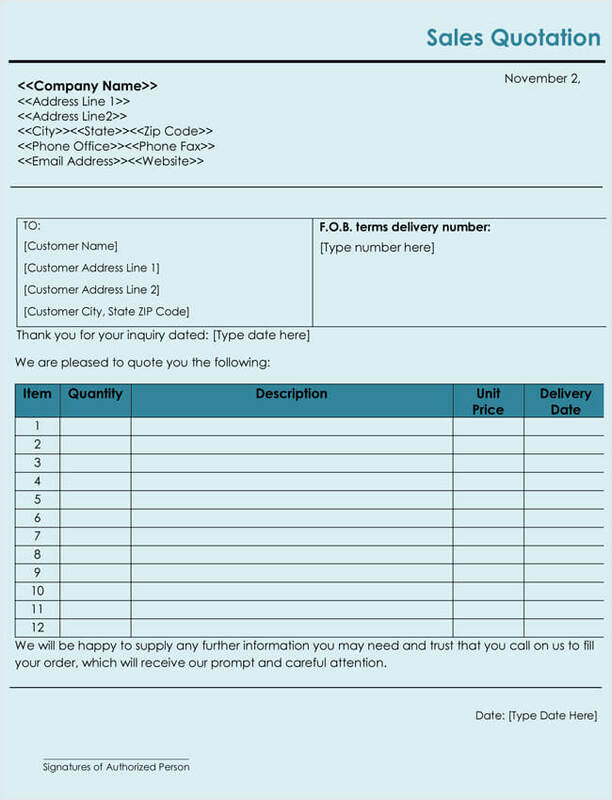 It is imperative that the Sales Quotation form be presentable and in a format that the client can understand as it is necessary to generate, initiate and keep sales. 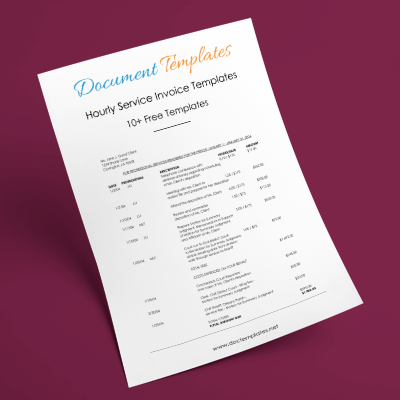 Our Sales Quotation Templates are easy to use, free to download, and customize for your business, and can be used with Microsoft Excel or Microsoft Word. Their professional layout is specifically designed to create a logical format for your business. 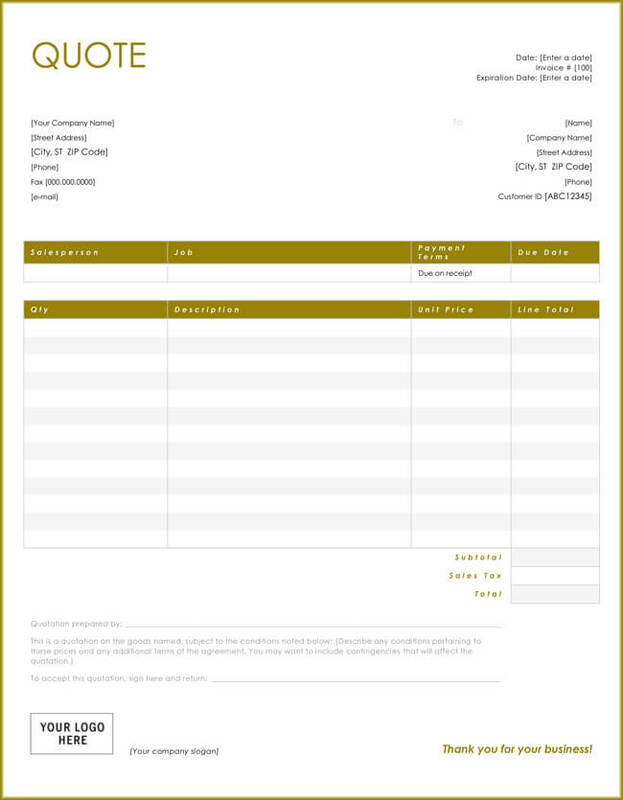 The Price Quotation Template is a very useful for both large companies and home businesses alike. 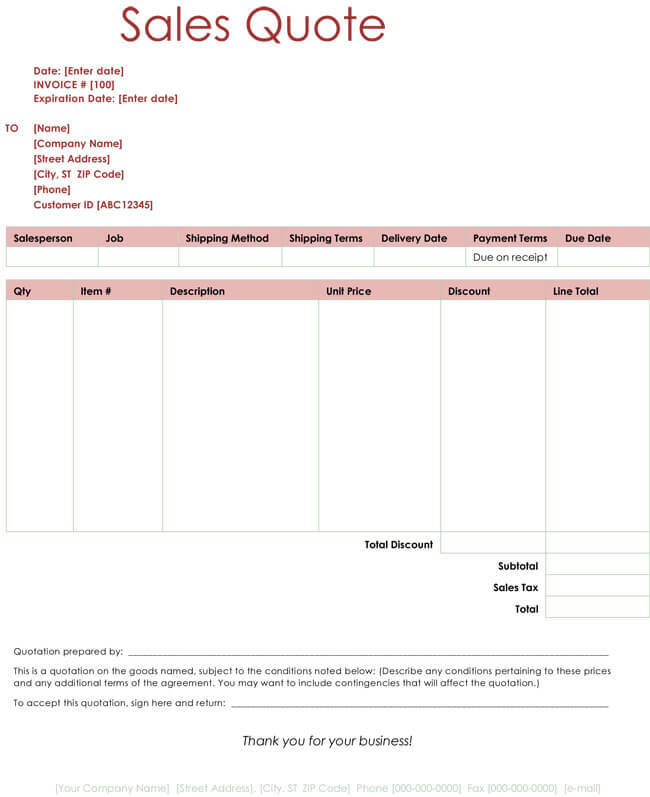 The price quotation form is used to communicate the various charges that a business intends to put forth to the customer. With these quotes, the customer can decide to do more comparison shopping, which involves obtaining price quotes from many companies until they find a company that meets their budget. Price quotes are also used by companies as a form of advertising in order to draw attention to what they can offer prospective clients. For instance, a private company that fixes garage doors may leave price quote flyers in neighborhoods, going door to door. Indeed, there are many applications for the Price Quotation Template. 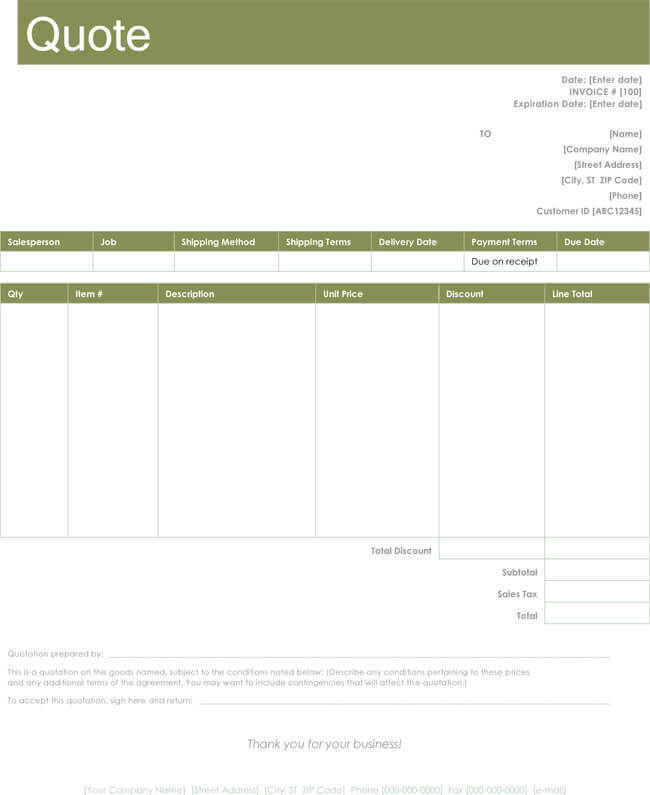 Our Price Quotation Template is free to download, and is available in both Microsoft Word and Microsoft Excel formats. These templates are easy to use, in that you just download, edit and print. Feel free to print out as many as you need. Car Quotation Templates assist you in providing the proper documentation which involve automobile transactions. The Car Quotation is the itemized list of costs involved that a car dealer provides to anyone interested in purchasing a car. For example, if you are shopping for a 2016 Ford Mustang with certain features, do some online research first. Then take what information you have gathered and visit dealerships. When you are interested in a certain car at each dealership, have the dealer provide you with a Car Quotation, or Vehicle Quotation, which will include, but not be limited to: price quote of the car, specs of the car, important features, dealer name, address of car dealership. Car Quotations can also be used when trying to bargain your way down to a better deal. Many dealers will try to outdo their competition when they see their vehicle quotes. Our Car Quotation Templates are free, can be used with Microsoft Word or Excel, and can come in handy when you are ready to shop for that special car, so just download the Car Quotation Template, customize that template to your particular needs, and print out as many as you need. Insurance can be a complex task. There are so many options, so many different features offered by so many different companies, that it can be hard to keep track of it all. An insurance quotation can help. 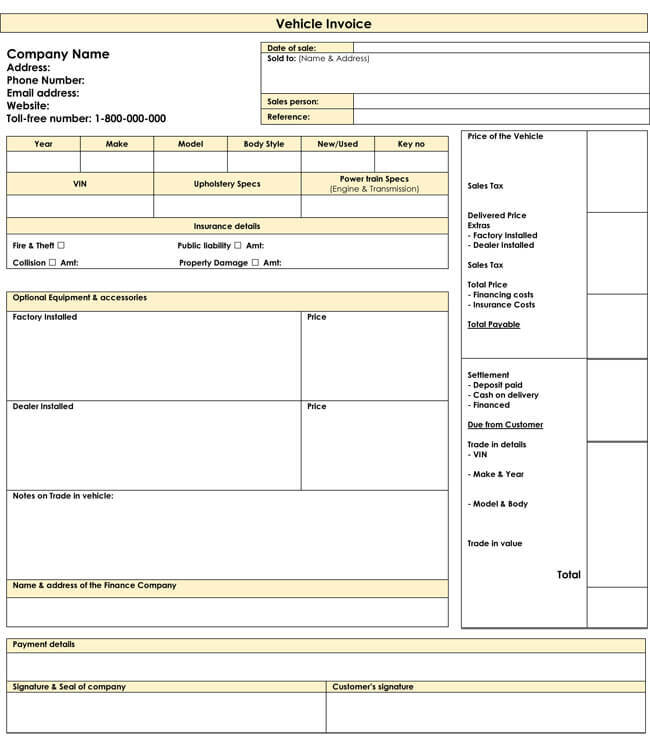 An Insurance quotation form contains estimates of insurance premiums and other information. For instance, say you are shopping for auto insurance. The insurance quote would contain information such as facts about the driver, including name, age, occupation, plus personal information such as do you belong to AAA, personal driving records, including any violations or accidents and their details. Lastly, this form will have an area for your vehicle information, including the year, model, make of the car, and mileage. Insurance Quotation Templates can take this arduous task and make it easier. Insurance Quotation Templates can be found for any type of insurance, including auto, health, medical, liability, life, etc. 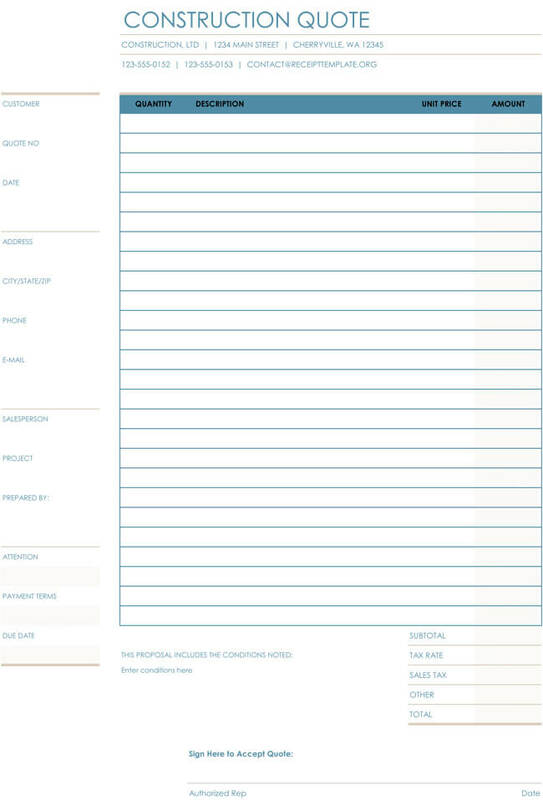 Our Insurance Quotation Form Templates are quick to download, free and easy to customize, and are guaranteed to assist you in making the process more streamlined, and easier to handle. All of our professionally designed templates are compatible with Microsoft Word and Excel. Stock quotations are the cost of a certain stock. Basic stock quotes contain information such as the bid and asking price, last traded price, and volume traded. In this modern-day and age, it’s very easy to obtain stock quotes. 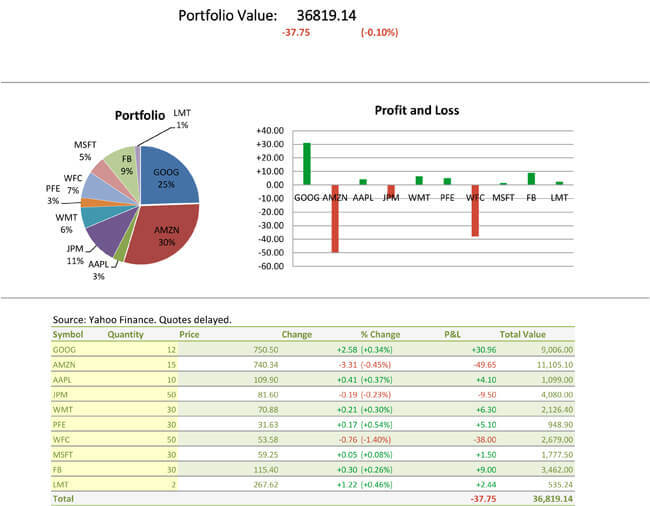 Anyone can key into a financial website for stock quote information. Stock quotes are very important for the investor, in that through using stock quotes it’s possible to keep track of your portfolio. 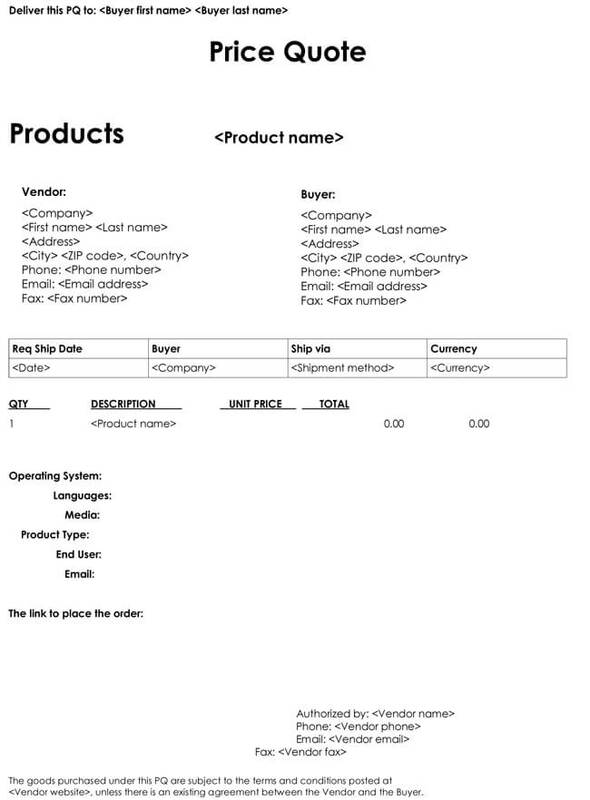 In order to make this task a little easier and more efficient, one may enlist the services of a Stock Quotation Template. These templates make it easy for you to organize your data in a concise manner. Our professionally designed Stock Quotation Templates are free to download and easy to customize to your particular needs. All of our templates are available in Microsoft Word and Microsoft® Excel®. We live in a world of technological wonder, a world run by automation and machinery. In this amazing world, one thing is for certain, and that is machines break down if they do not undergo regular maintenance. Whether it’s a bus or CNC lathe, all machines require regular maintenance to keep them up and running, and this is where the Maintenance Quote Template comes in handy. Maintenance quotes are a must when it comes to addressing maintenance procedures such as estimated labor costs, cost per hour, parts and supplies that may be necessary. Our Maintenance Quotation Templates are just the thing for anyone who needs to write-up orders for scheduled maintenance on machinery. These Maintenance Quotation Templates are free, easy to download, come ready for use with either the Microsoft Word or Microsoft Excel, and can be customized to fit your particular business requirements. If business travel is a big part of your life, then you know how important it is to cut costs. Hotel Quotation Templates can offer you a huge help in that area. Whether you apply for a quote online, in person or by phone, a hotel quotation form can take all of that information, and put it in a nicely ordered fashion for your final comparisons. These Hotel Quotation forms tabulate the services that each hotel will offer you, the features of the hotels, any discounts, payment terms, as well as length of stay. 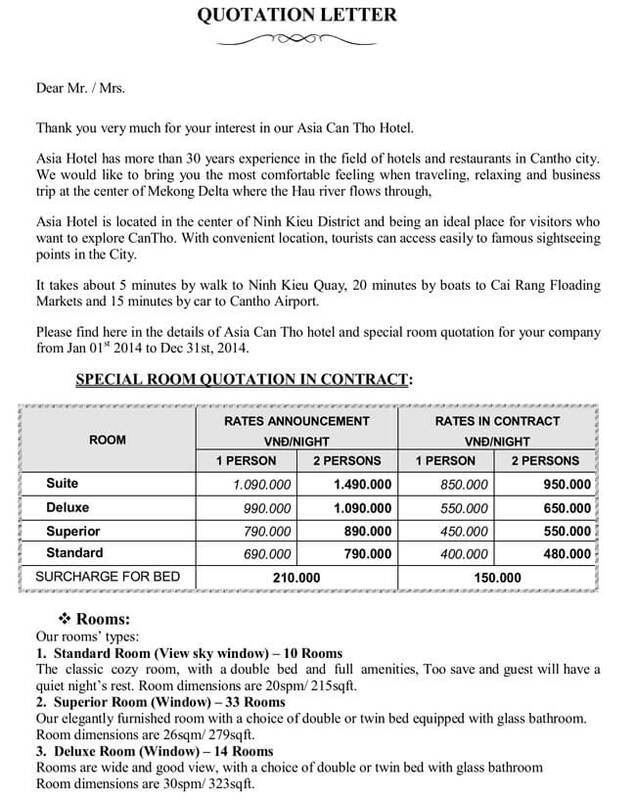 Hotel Quotation Templates are a very nice way of doing some fast comparison shopping for the best deal for your needs, after all, traveling can get a little pricey so these forms can help you stay within budget. Our Hotel Quotation Templates are free to download in both the Microsoft Word and Microsoft Excel formats. Technology, it’s here to stay. We practically live in our computers, via social media, job searches, watching news, movies and tv. Computers are now a staple in our homes, offices and entertainment centers. For business? The computer is the lifeblood of the company. Given all this, one thing is for certain: We are, in part, dependable on computers for our activities of daily living. When one of our computers breaks down, it’s imperative that we find a way to get it fixed, and fast. 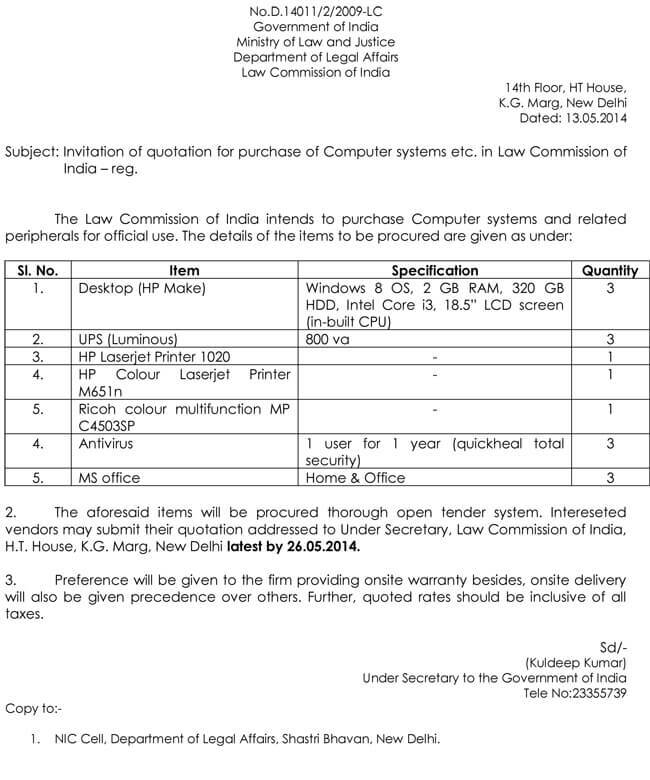 The Computer Service Quotation Template makes the search to find a reputable computer maintenance and repair service one that will be able to fix the issue, in the time allotted and within budget constraints. 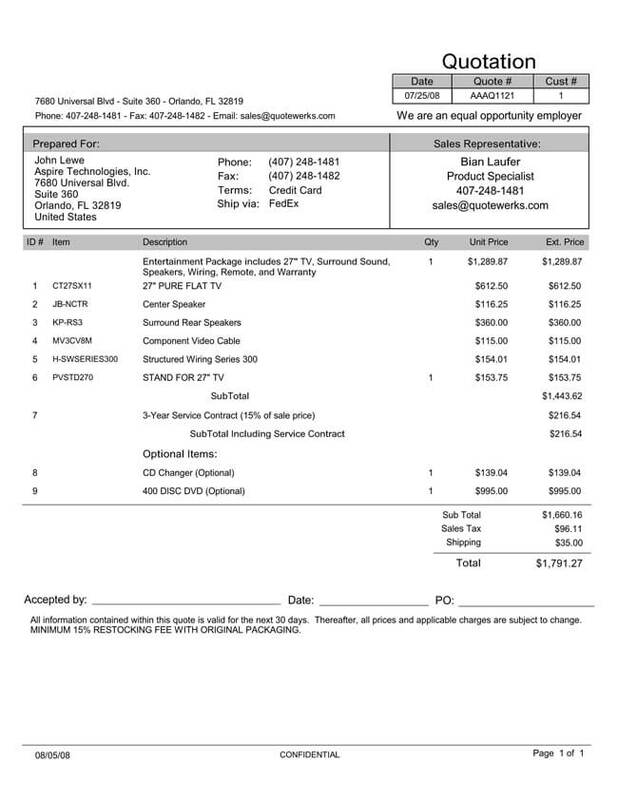 Computer Service Quotation Templates are free, and allow an individual to compare and contrast services of various companies in order to get the absolute best deal for their budget. Our Computer Service Quotation Templates are available both in Microsoft Excel and Microsoft Word, and are quick customize to your specific needs. 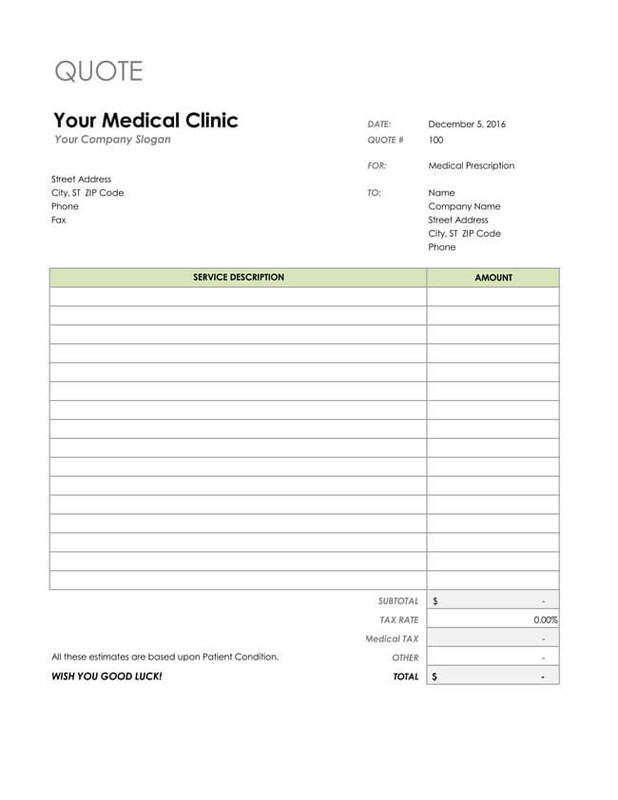 Medical Quotation Templates are a necessary part of a well run business, organization or group that is in the market for a clinic, medical center or hospital to partner with in order to provide any medical services that are necessary. These medical quotation forms help in evaluating which medical services will suit the company best, and they make their choice from there. Such information may include what services are provided, hours of operation they are available, and the cost of such services. Individuals can also use these Medical Quotation Templates as they do their own shopping for the best services in their area. Our Medical Quotation Templates are professionally designed and take only a few moments of your time to download and customize. These templates are free to download, and are available for both the Microsoft Word and Microsoft Excel formats. 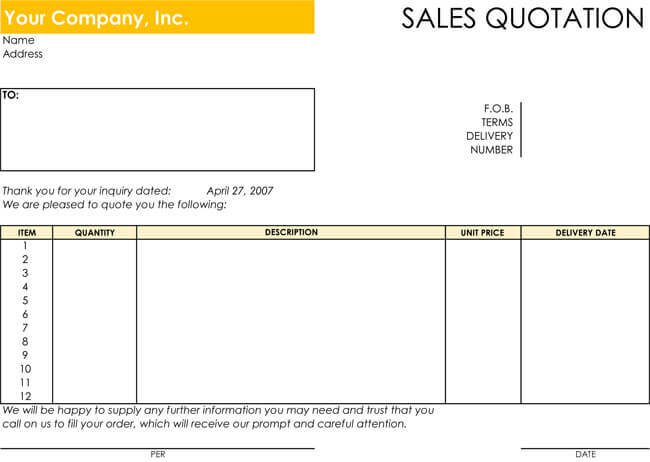 The General Quotation Template is an extremely useful tool in business, especially in sales. When you are in business, the main objective is to make a profit for yourself and/or your investors. In order to obtain and maintain a profit, it is imperative that you secure clients, or customers to partake of your goods/services offered. The General Quotation forms are a way for businesses to reach out for clients, create business dealings by offering them estimates on what services they can provide. The client or customer can then compare this quote to that of a competitor, and perhaps use it to their advantage by making a deal to bring their prices down. Both sides win here, in that the client gets a deal, and the business gets a client. Our General Quotation Templates are free to download, and available for use and quite easy to customize. All that you need to do, is to download the template, edit and print. Groups, organizations, businesses and individuals that are searching for a particular service will find Service Quotation Templates very handy indeed. 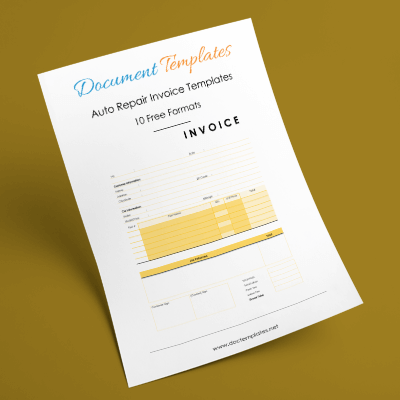 These templates will offer you a concise and orderly way to organize your quotes so you can end up with the best deal on a particular service that you can get. Our Service Quotation Templates are professionally designed and made to be customizable by you, according to your specific business needs. Using one of our templates is very easy. All you need to do is to download the template, edit the template and print it out. 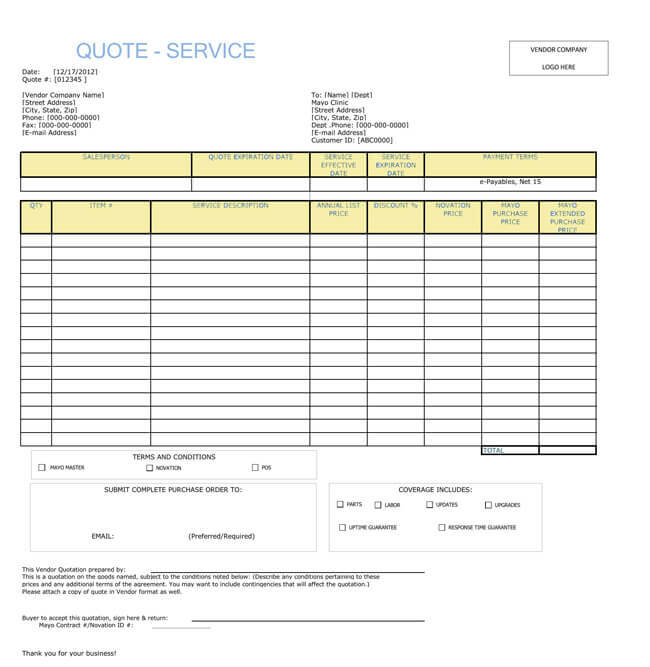 You may print out one Service Quotation Template, or you may print out as many of these templates that you need. All of our templates are free to download, and are designed to work with both Microsoft Word and Microsoft Excel. Often, a business needs to decide whether they are going to charge the customer a fixed, flat rate, or an hourly rate, for a specific service. 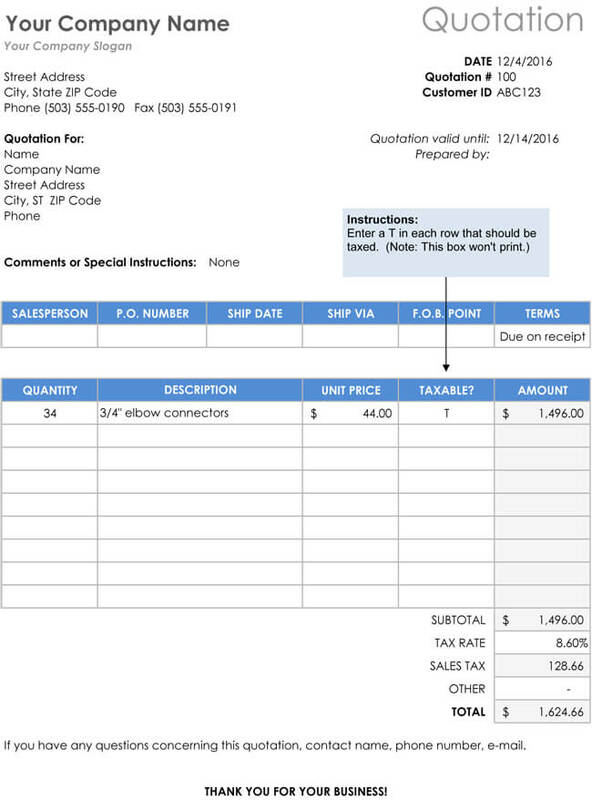 When the business decides on an hourly price rate, they use hourly quotation forms. These forms will outline the name of the business, client, the type of service, any discounts, payment terms, and the cost that will be charged the client per hour. Our Hourly Price Quotation Templates are free to download, and compatible with both Microsoft Word as well as Microsoft Excel. All of our templates are easy to use and customize. It just takes moments to download your Hourly Price Quotation Template, customize it with all your information, and print it out. 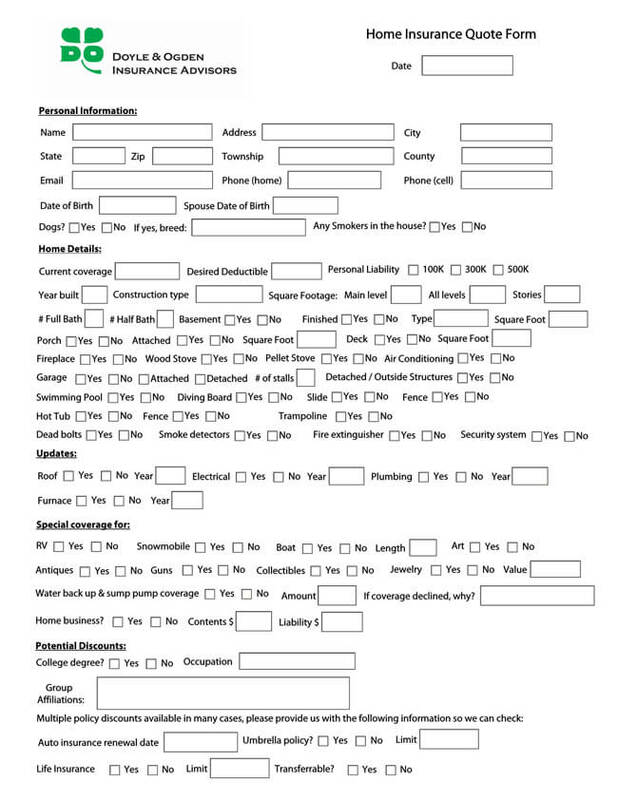 You may print out one template or as many as you require. Businesses often find themselves having to bid for projects. This means they put forth a proposal and the company chooses which business they wish to work with, based on the bid proposal. Bidding is an extremely important for many businesses, such as construction companies, as it’s one of the main ways they secure business for themselves. 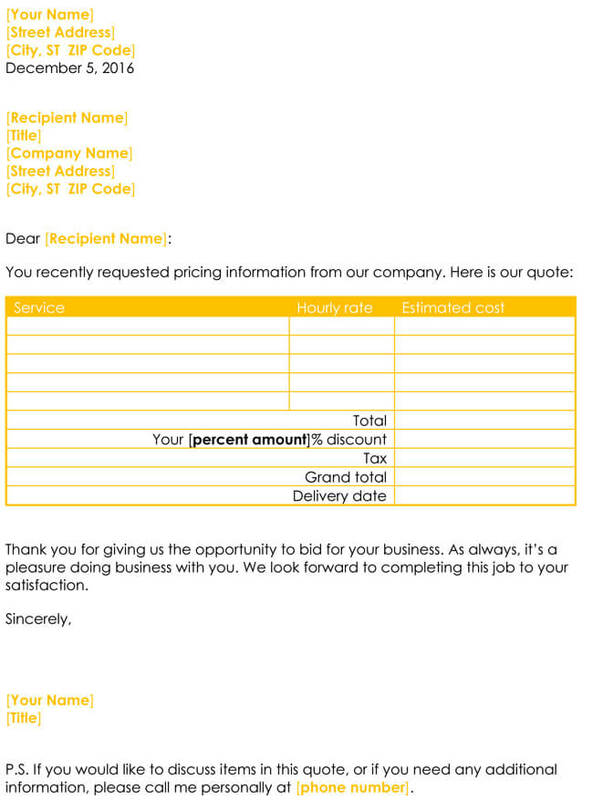 Bid Quotation Templates offer the business a professionally designed format with which to propose their bid. It is terribly important that a company’s bid be in a layout that is orderly and professional. Any bid that is not deemed professionally done, will no doubt be bypassed, without even studied. Our Bid Quotation Templates are professionally designed and easy to understand, and will present your bid in the most favorable light. 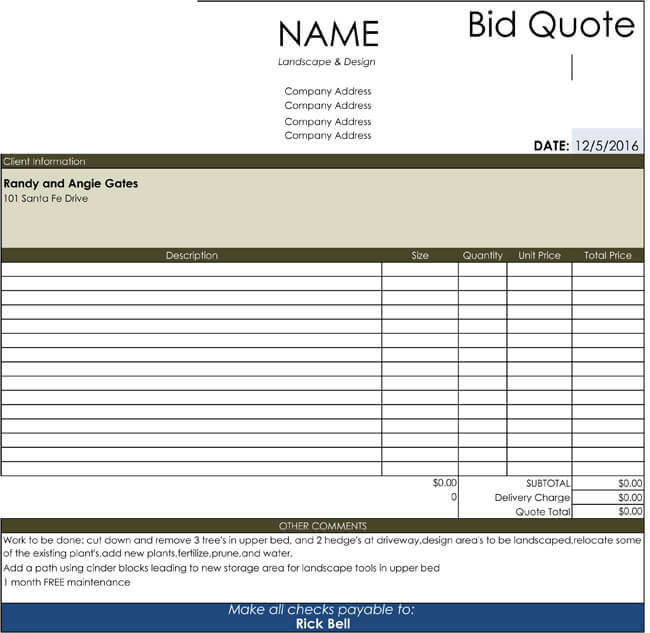 Our Bid Quotation Templates are free, very easy to use, and can be downloaded and customized in just moments. When individual homeowners or businesses need construction to be done, they contact a professional construction company. The construction company then assesses what needs to be done, and develops a construction quote for the prospective customer. This quote will include an estimated cost of man hours, payment terms, materials and supplies. 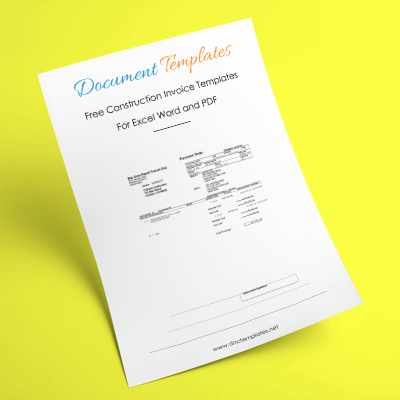 Our Construction Quote Templates are professionally designed, free to download, easy to understand and are compatible with both Microsoft Word and Microsoft Excel. These Construction Quote Templates are easy and efficient to use, and require just moments to set up. 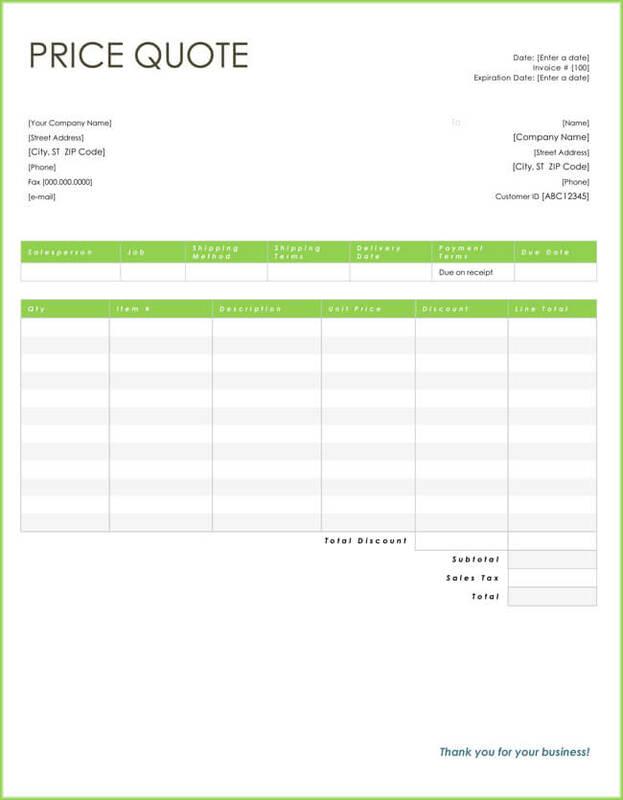 All that is required is that you download the template, customize it, and print it. 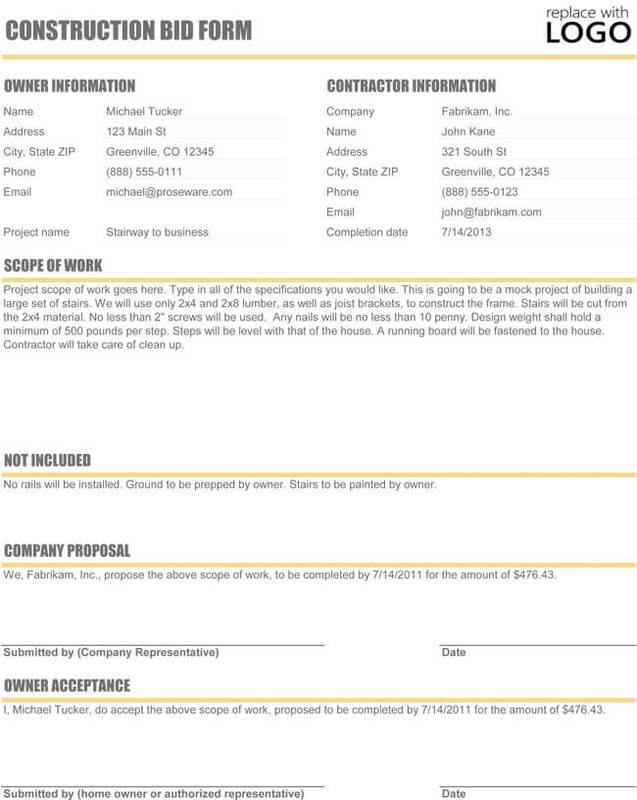 Remember, you are free to print as many of these Construction Quote Templates as you need, for as long as you need them. 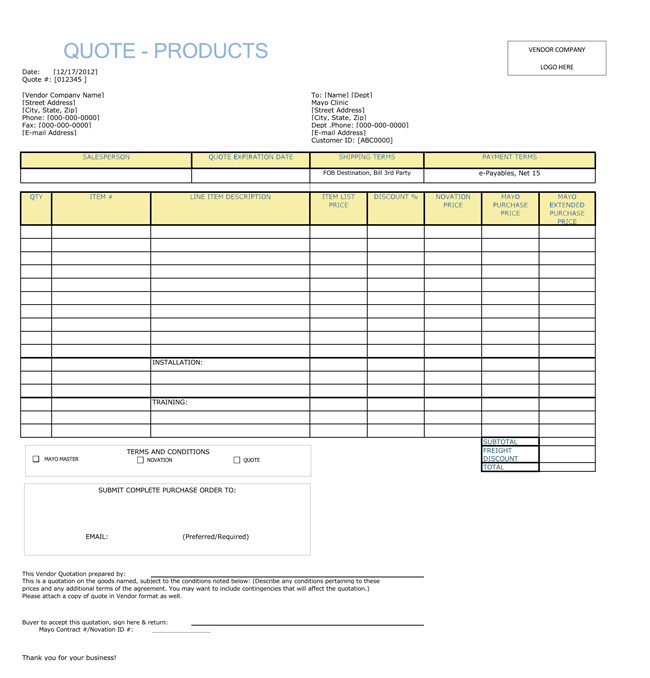 As can be seen, quote templates can add to the efficiency of any business. All of our templates are available free for download and can be easily customized. Whether you are dealing with construction costs, bid proposals, medical concerns, sales and pricing or general goods and services, there is a template available which can be suitably customized to meet any and all of your needs.